During our initial field trip, night photography was found to be an important supplement to GigaPan images shot during the day, particularly for complex scenes with deeply incised figures. 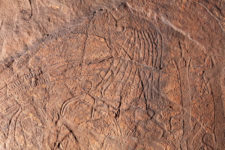 Certain petroglyphs, because of their method of manufacture, variation in color, overlapping figures, weathering, and patina, are difficult to record in regular daylight. This is particularly true in Saudi Arabia, where sunlight can be direct and extremely intense. 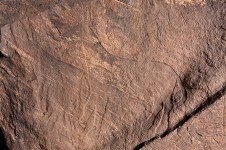 Some petroglyph murals therefore benefit greatly from the application of specifically targeted, low-incidence lighting, raking across the stone surface at nighttime. 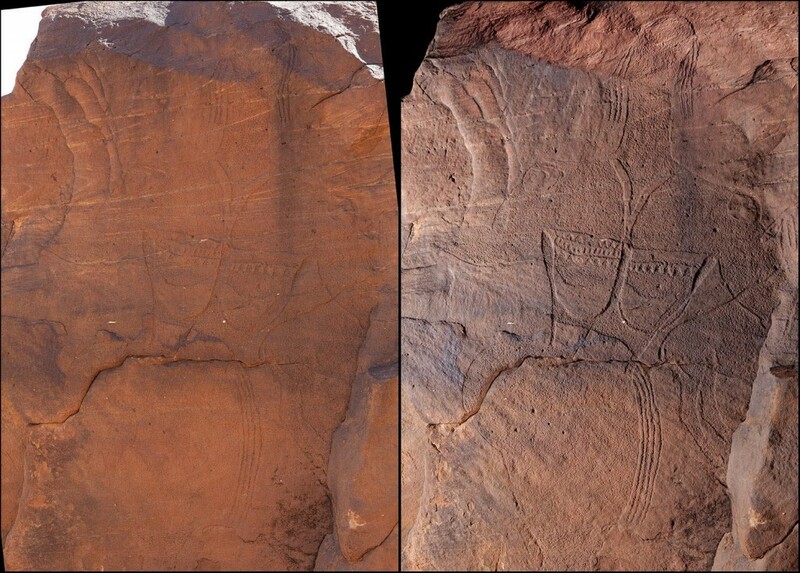 Comparison of “the Queen” panel shot during the day (left), and night (right). 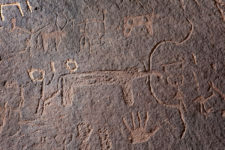 Richard T. Bryant found that night photography yielded amazing results on the deeply incised Neolithic images at Jubbah, Shuwaymis, and Qaryat al-Asba (Graffiti Rocks).